Iguazu Falls in the South America are the largest waterfalls in the world. 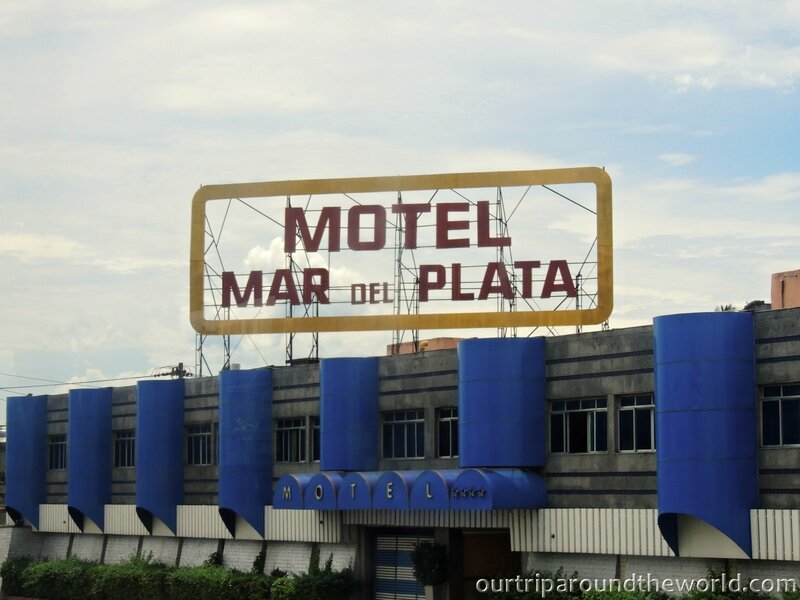 Located on the Iguacu river and situated on the territory of two countries. Brazilian Iguacu Falls, in Portuguese Cataratas do Iguaçu, lie in the Paraná province. Argentinian Iguazu Falls, in Spanish Cataratas del Iguazú, lie in the province of Misiones. It’s good to consider visiting both sides of the falls as each of them offers different but still fascinating views. Waterfalls were first recorded by a Spanish conquistador Álvar Núñez Cabeza de Vaca in 1541. Today the falls are a UNESCO heritage. Together with waterfalls there are two national parks formed by a rainforest under protection. 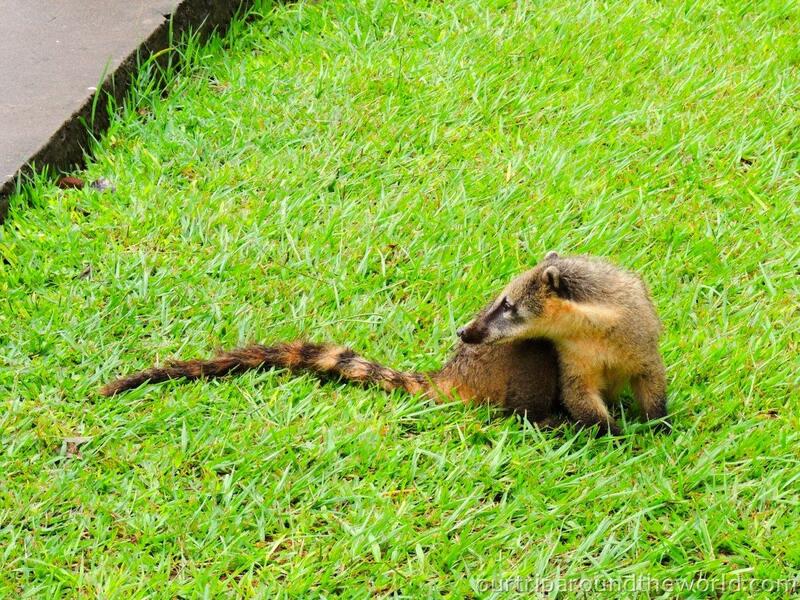 Going on a tour in the national park means meeting animals like butterflies, toucans, parrots, caymans, monkeys or raccoons and jaguars in their natural environment. It’s very easy to get on the Brazilian side of the falls from Foz do Iguacu. That’s the place where we stayed. Foz is a small city in Brazil but for us it was still quite big. Beyond the falls there are more places to visit. One of them is the largest water power plant in the world Itaipu dam, or you can go to the place known as Marco da Tres Fronteiras (the Three Fronties) where rivers Iguacu and Paraná blend together and offer an amazing views to Argentina and Paraguay. In the town you can see a mosque or explore the Buddhist temple. In case you have enough time after visiting the falls, stop at the Bird Park nearby. 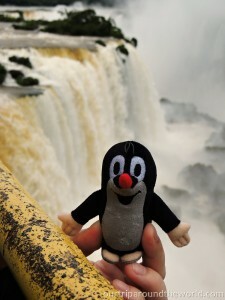 Find out more about how we got from Rio to Foz do Iguacu. 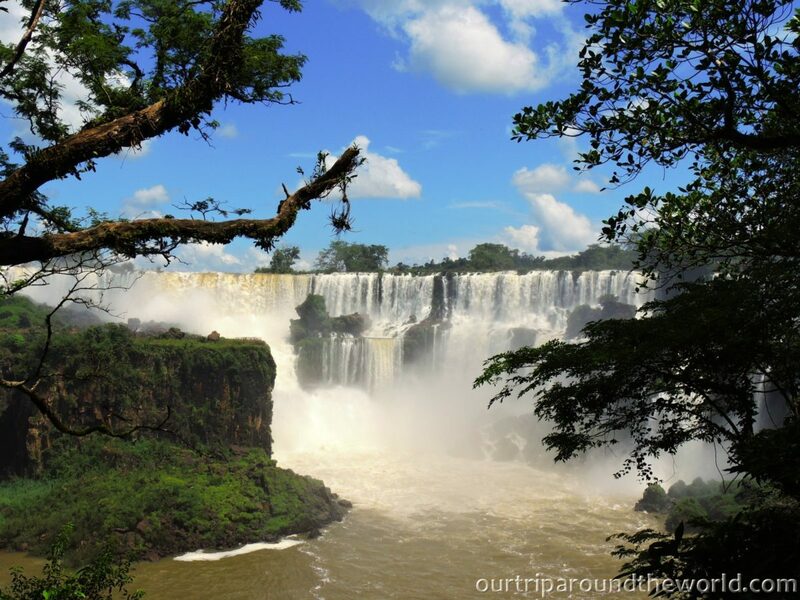 How to get to the Iguacu falls? Most buses heading towards the falls start at the Terminal station. If you live closer to the falls you don’t have to go back to town. Public transport tickets can be purchased only in cash and need to be paid in the bus. If you transfer at the Terminal you use the same ticket you bought before. Notice that you will not get any printed ticket. You only pay and go. When arriving to the park go to the cash desk. On the Brazilian side of falls credit cards are accepted. Price is 52 BRL (20 USD) per person. Go inside and get on the bus. It drives you to the trail heading to the waterfalls. From here you have to walk. The trail is easy to walk and pass through takes 3-4 hours including breaks, observing and shooting photos. Falls views are truly beautiful. At the end of the trail you can go up with the elevator to see Iguacu Falls from the above. The Brazilian side offers better and complex view on the falls. Nevertheless the real surprise is waiting for you on the Argentinian side. But first of all you need to get to Argentina. 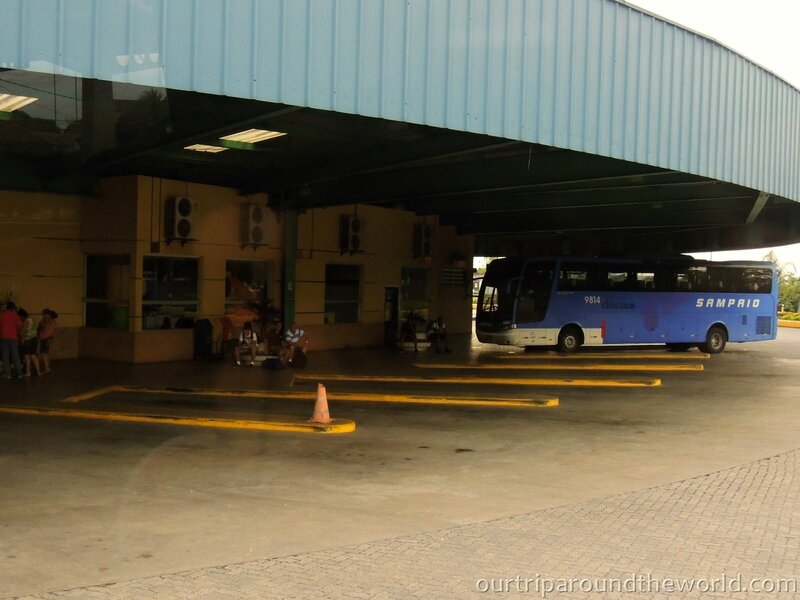 Read more about bus from Foz do Iguacu to Puerto Iguazu. It is not possible to pay the entrance ticket with debit or credit card on the Argentinian side of the falls! Nevertheless there are 2 ATMs therefore it is not necessary to exchange money in advance. In case you plan to visit this side of falls the other day keep your ticket. We saw several leaflets saying you will get a discount of 50%. Unfortunately they did not say till when this deal is valid. Immediately after entering the park and a short walk we knew that this park is much larger. Visiting the park will take you all day, nearly 6-7 hours. Our first journey led to a train station. By a train we reached the first station Estación Cataratas. There are 2 trails. The red trail marked as „Passeo Superior“ aka the Upper trails is 650 meters long. There are 6 waterfalls on this there but it is possible to observe them also from the opposite site. The blue trail „Circuito Inferior“ aka the Lower trails is 1400 meters long. You can find here only two waterfalls but on the other hand there is a spectacular view on all falls that are on the red trail. Absolutely recommended! After walking these two trails we went back to the train station and went on to Estación Garganta. We took a short walk along the trail „Passeo Garganta del Diablo“ aka the Devil’s Throat. 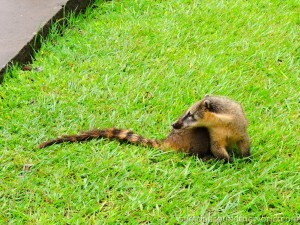 We were only 1100 m from a really magnificent experience in Iguazu Falls. When we appeared on that amazing and so beautiful place we had a feeling like standing at the end of the world. We stood 5 meters from the waterfall top. It was breathtaking and fascinating. Photos may not say much but enough that you can have the idea of what it was like there. 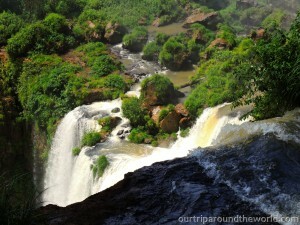 Great images by photos and video of Iguazu Falls. It must be an amazing place! And thank you for the photo of me among the Frankfurt pictures! 🙂 I hope you will enjoy your further journey and I am curious about your next reports.